One of the sweetest couples you'll ever hope to meet. 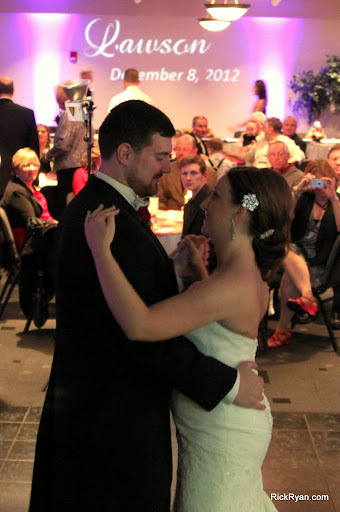 Mollie booked us in B&B Photography's all-inclusive package (photo + video + DJ + Uplighting). By the way, great crew (as always) with B&B. Love working with those guys. Mollie called the week before, stressed out that they had too many guests and that the venue was going to have to move them to a room that she felt wasn't quite as pretty as their original selection. I assured her that we'd take care of it and she was nice enough to put her trust in our service. It never ceases to amaze me at just how much difference good Uplighting can make to a room. It takes a good venue and turns it into gorgeous! Next up, Mollie told me she wanted her monogram, the couple's last name and wedding date, placed behind the head table. 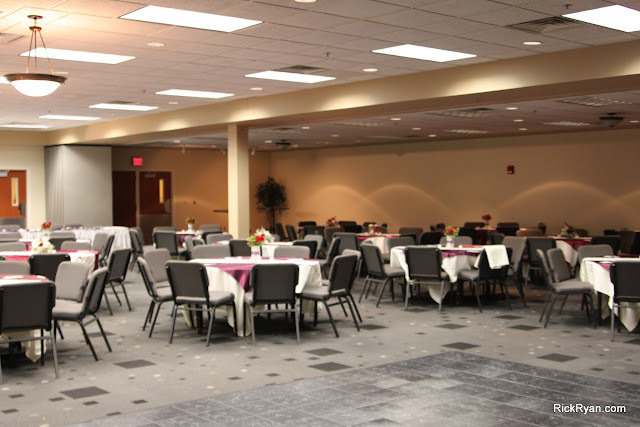 The venue had placed a small, black pipe & drape setup behind the head table, which we scrapped. It was a gamble, given the bride wouldn't see it until she arrived, but turns out it was a gamble worth taking. Mollie said she loved it. The Knicely Center has a very nice programmable lighting system and was kind enough to let us tweak it out for this event. We setup a medium-lit program to be used for dinner and then another slightly darker look for dancing. This is a great feature (from a lighting perspective) for this room. Guest count was right at 200. 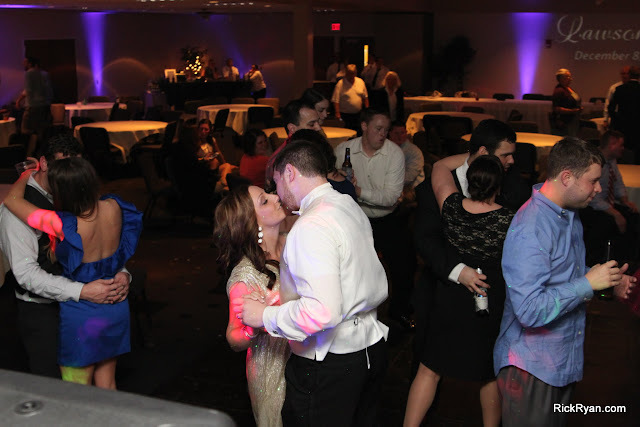 After dinner was over we used an Anniversary Dance to start things off. It was great and our winners had been married 62 years! By this time the guests were primed and ready for action and ate up everything we threw at them. "We hired Rick Ryan as our DJ after hearing great things about him from a friend. He was amazing. We had a last minute room switch at our venue and we were not at all happy with the new room. It was very drab and everything was just gray. We had been counting on the natural beauty of the original room. 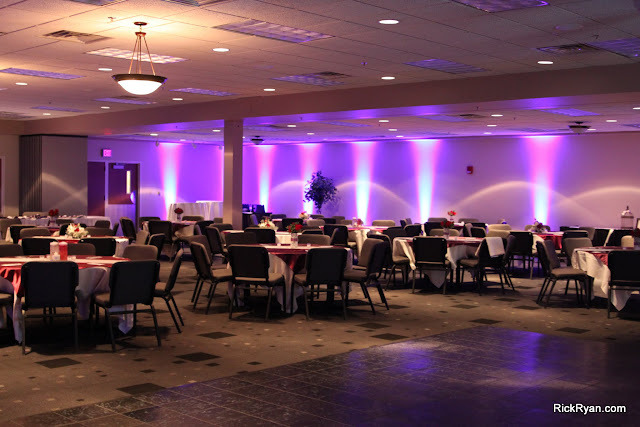 Rick made our reception look FLAWLESS with his uplighting. 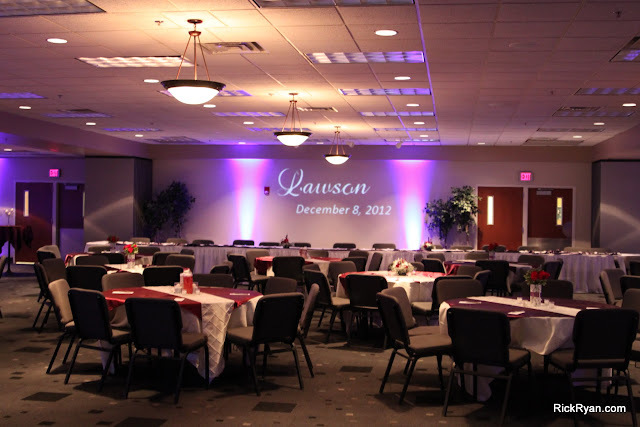 He washed the walls with purple light and had our new last name and wedding date on the back wall behind the head table. It looked fabulous. The pinspotting he used on the cake made it a major focal point of the room. He played music that everyone wanted to hear and the dance floor was constantly full of people. He didn't play anything cheesy at all. 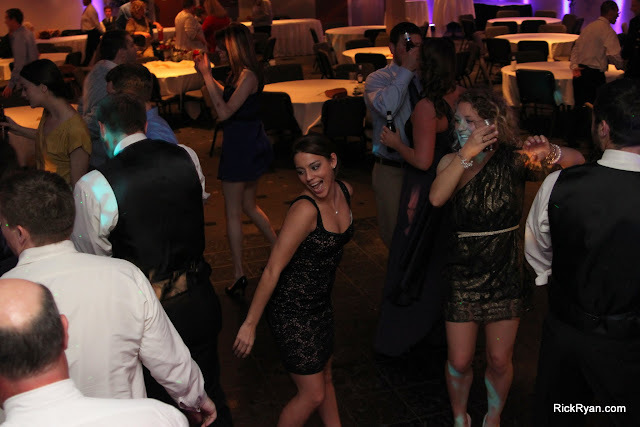 All of our guests said that they had a great time. I would definitely recommend him and would use him again if we had another event. Thanks so much, Rick!" Thanks guys, for allowing us to be a part of your celebration. We wish you all the very best in life.